RRG Group has rewarded the long service of 68 employees who have been employed by the North West-based car retail group for a combined 1,850 years. 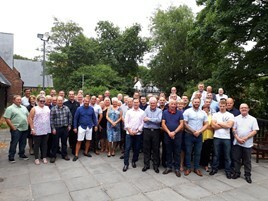 The Salford-based AM100 franchised car retail group employs over 800 members of staff but took the select group out for a celebratory luncheon to mark various landmarks of 20 years (13 staff) and 30 years’ service with some having served the business since the mid-1970s. RRG vice-chairman, Arran Bangham, and managing director, Tony Cliff, hosted the event at the Worsley Marriott Hotel. Arran said: “We are in a fairly unique position, in this day and age to have such a high proportion of long serving team members, with over 68 staff, each with over 20 years’ service. In 2017, the group has celebrated 50 years in business and the recent addition of Skoda Bolton to the RRG business makes them one of the biggest car retailers in the North West, operating 21 dealerships, two Accident Repair Centres and a fleet business. The group represents Kia, Lexus, Mazda, Nissan, Peugeot, Skoda and Toyota. In its last published accounts, to March 31, 2017, RRG reported a turnover of £315.6m, up 8.8% on 2016’s £287.8m, with a profit before tax of £4.33m, up 14.8% on the previous year’s £3.69m.